During the 1980s, Thessaloniki functioned as an international crossroads, attracting several musicians in the genre of free improvisation. Chryssa Tzelepi and Akis Kersanidis’s documentary In Situ portrays the rich, innovative and dynamic local scene of improvised jazz in Thessaloniki, Greece as well as its interaction with international scenes across countries like Italy and Germany to name a few. The film allows for its audience to experience and better understand a fascinating aspect of Thessaloniki’s cultural history, especially its prominent position within a Europe-wide network of avant-garde improvisational musical composition and performance. 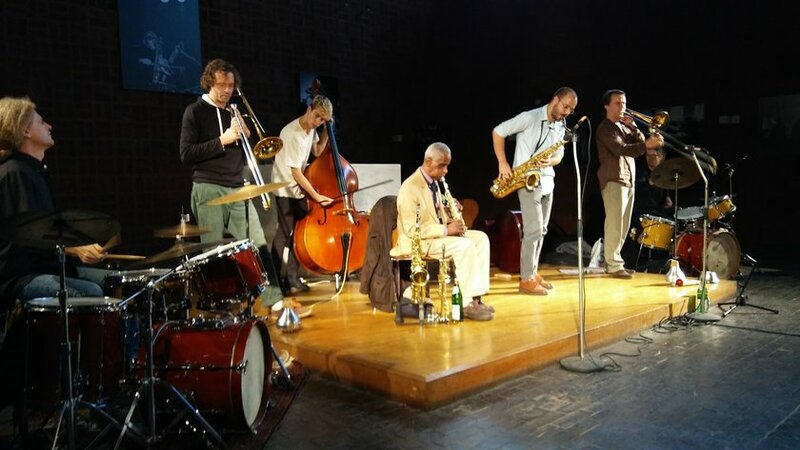 Traces of this creativity are still visible throughout the city, expressed both through younger and older musicians actively participating in this genre. 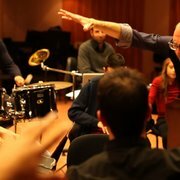 The documentary film features iconic musicians in the realm of free improvisation such Sakis Papademitriou, Floros Floridis, Gianni Lenoci, Gianni Mimmo, Gunter “Baby” Sommer, Christos Yermenoglou, Petros Damianides and Leo Feigin.The film gives us a rare glimpse into the extraordinary creative practices of these artists, each one of them using their instrument in their totality, breaking conventional norms, portraying how the idea of ‘in situ’ not only drives the musicians work and art form but transcends into their way of living and thinking. Both Tzelepi & Kersanidis started their careers in photography and then moved into directing and producing films. Tzelepi has had several solo and group photography exhibitions in Greece and abroad credited to her. She is also involved in organising the Experimental Film Festival Strange Screen. Since 1994 Kersanidis has been working in the field of creative documentary and experimental video. He has directed performances of mixed media with music, dance, painting, film and video, and also several theatrical plays. WOMEX Film had the opportunity to catch up with the directors, who were present at WOMEX 18 in Las Palmas de Gran Canaria. Here is an excerpt from the conversation. Sana Rizvi Where did the idea for the film come from and how long did it take you to research and shoot? Can you also give a bit of background if any on both of your connection with music especially the improvised music scene? Chryssa Tzelepi and Akis Kersanidis The idea has been following us for many years. We both love free and improvised jazz music . We went to our first concert in the 1980s, organized by Sakis & Floros in Thessaloniki. We fell in love with the work of Sakis Papademitriou and were following all his performances very diligently for a long time. With time, he became the main inspiration for the film and we wanted to honor his work, life and contribution to the field. At the beginning we didn’t know what kind of documentary we would be making. We started collecting images and sounds from the genre about 15 years ago and in 2010 realized that we had enough material to make a film honoring the work of these artists. Both Sakis and Floros belong to Thessaloniki, which has for a long time been the center for everything new in Greece. Not Athens but Thessaloniki. It is a small but eclectic city by the sea where artists from all over the world congregate. The city has a big university so lots of new and young people keeping flowing in, adding to the experimentative nature of the city. The avant garde improvisational jazz scene has been a big part of the city and so we were lucky that we had the chance to follow the scene from very close since we both belong to Thessaloniki. SR You have so many interesting characters in the film- did you pick and choose beforehand who you wanted to portray in the film? CT & AK We didn’t pick and choose. We basically followed Sakis from when we started going to his concerts and then along the way we looked at how Greek musicians connect and affect each other as well as other musicians from abroad and vice versa. 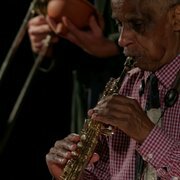 Sakis introduced us to Roscoe Mitchell and it was perfect timing for the film. The improvised jazz scene is one big family all around the world that functions like a real community. They might not know each other but they definitely know of one another and share this common language and passion for improvisation. 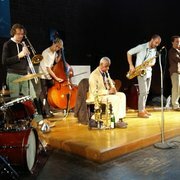 Since improvised jazz has so much to do with their lives and vice versa, when they play they basically bring their lives on stage. SR The idea of improvisation is truly interesting in today's times of pre-planned music - but when you had to shoot the film it was more planned? Did you have moments where you thought you would improvise the shoot as well? CT & AK We had 2 to 3 cameras while shooting. Our shots were planned and the only improvisation that took place was in the music we were documenting. We did though have a lot more fluidity while editing the footage but otherwise our presence and interviews were well planned. SR There is a scene where one of the musicians mentions that many of the sessions have not been documented so a moment in time is completely lost as it can't be recreated- is it important to document improvised music when it is just that - a moment in time that doesn't exist outside of that moment? CT & AK We have tried to document moments in their performances, which of course don’t exist outside the actual moment. But then nothing in life does. And as one of the musician puts in the film, “Life is played out in our performances”, meaning everything is an improvisation and only present in that particular period of time. The rest is a memory of an experience. It was very important for us to document these concerts and capture the musicians’ passion and the way they live their life to give us an understanding of their music philosophy. We had so much different material and live footage to choose from, since each time brand new music was being created. The first cut of our film was 3.5 hours long! SR What is the improvisational jazz scene like at the moment in Thessaloniki- is there a revival? CT & AK Greece has been going through a series of political, economical, humanitarian crisis with many people living below poverty levels. Artists have lost their job and till very recently the police was harassing them if they were caught playing music in public spaces. There was a huge demonstration against this law where even Manu Chao came to support the musicians who live in Thessaloniki, and finally the law in regards to playing on the streets has been changed. Thessaloniki has always been an active city with a lot of music around so there is definitely a revival of the jazz scene that has adapted itself to the circumstances it faces in terms of this major upheaval we have been going through. The art that is coming out in the city is a reaction to the crisis. The music has become more underground, giving rise to more improvised music. There is nothing to lose as such so people are experimenting. The music has become a political statement. There are more jazz clubs now in Thessaloniki than before! One of the musicians in the film also states that improvisation is the way to survive. In Situ was part of the WOMEX 18 Film Library with the directors in attendance as well. In case you missed watching the film during WOMEX, you can stream it online through the virtualWOMEX platform using your login details. This offer ends on Friday, November 30, 2018.